In the UK, the US and Canada antibiotics are used in beekeeping for management of Foulbrood disease (‘What’s in your honey?’, September 16-30, 2010). Their use is permitted as per set guidelines. rpas, or Reference Points for Action, for chloramphenicol and nitrofuran in Canada are 0.3 parts per billion (ppb) and 1.0 ppb, respectively. I have a query: a beekeeper in India, for example, has 1,000 honey bee colonies. If these colonies are diseased due to an outbreak, should the keeper give any treatment or let the colonies die? If a human catches that infection, should he not take antibiotics? You have rightly pointed out that antibiotics are permitted in countries like the US, the UK and Canada under strict supervision. When it comes to India, there are no such rules. Despite honey being regulated under bis and agmark, no permissible limit for antibiotics has been set. It was only after Down To Earth’s September article that the Food Safety and Standards Authority of India issued an advisory saying no antibiotics should be allowed in honey. The irony is, there are bodies like the export inspection council to check the honey India exports, but there is no mechanism to check the honey Indians eat. Now the answer to your query. Entomologists at Punjab Agricultural University recommend the “shook swarm method”, wherein the affected bee frame is isolated to keep the disease from spreading. Choudhary Charan Singh Agricultural University in Hisar suggests eco friendly measures like sticky paper to trap mites. Beekeepers have the right to save their hives. Antibiotics should be administered only after consultation with entomologists. Even humans take antibiotics after the doctor’s prescription, don’t they? The major reasons for common land being lost are land reforms and village panchayat laws (‘Return of village land’, February 16-28, 2011). They have weakened the panchayats, making them vulnerable to forces that work for their own interests. Can the Supreme Court reverse the impact of what the Delhi administration did in villages like Kanjhawala in north west Delhi in 1977? Officials ignored the customary authority of the village’s proprietary body and leased about 50 hectares of the village commons to landless Dalits. Before the Commonwealth Games last year, the poor of Delhi were shifted to slum-like dwellings built on the commons of villages like Sowda in Delhi. In the neighbouring village of Gheora, the Indian Oil Company has built oil stocking facilities on the commons. It even parks its massive tankers along the road which connects the two villages to the outside world. State governments take over common land in the name of development and later sell it to big corporations to fill their pockets. The Supreme Court has to support local communities’ efforts to self-govern. 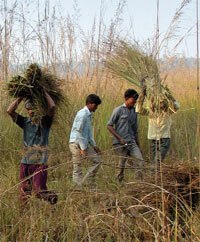 Almost 83 per cent of farmers in rural India are categorised as “small and marginal”. They possess small tracts of land and produce mostly for self subsistence. To supplement their income they rear cattle. But with the decrease in grazing land, owing to encroachments by private builders and government schemes, agricultural production has declined and the health of livestock has been affected. The Supreme Court’s decision on January 28 to evict illegal occupants of village commons is a good attempt towards bringing livelihood security to the marginalised. 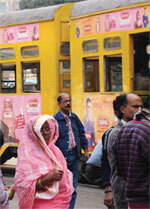 The article ‘Tram to oblivion’ (March 1-15, 2011) throws light on features desirable in a mode of public transport. This is discussed in the context of trams vis-à-vis other modes of public transport. The write-up gives an impression that spending on modern tram technology and keeping it as a viable alternative mode of transport was deliberately withheld. Since trams are environment friendly with carrying capacity higher than that of buses—careful evaluation on grounds of efficiency is needed before arriving at conclusions. The article is well-timed. It is ridiculous to argue in favour of private transport owned by a minority asking for the lion’s share of road space. Trams can definitely coexist with other forms of public transport. They are also much cheaper. It is the tragedy of this country that politicians and bureaucrats lack the wisdom to understand this. The article ‘Drought hit’ (February 16-28, 2011) reveals how unscientific water conservation methods have led Jharkhand to water scarcity. In the first instance, a water table depletion of three to five metres is not considered worrisome by groundwater engineers. In fact, such an amount is not a problem and the same is accounted for as seasonal variation while installing submersible pumps in deep borehole tubewells. In addition, a water table at 17-20 metres below the surface is not abnormal where groundwater is to be extracted from deep aquifers. In a state like Jharkhand, where reportedly there are no deep aquifers, rainwater harvesting is the only answer. But according to a report, the state’s chief minister has sanctioned 17,000 tubewells. Even an annual rainfall of 500 mm is sufficient if rainwater is scientifically conserved. Jharkhand ought to learn from Gujarat where with an annual rainfall of just 550 mm, the government and the people harvested rainwater resources to meet their needs. Gujarat has almost double the population of Jharkhand and ground water in its coastal areas is saline. If the Drug Controller General of India (dcgi) cannot set standards for additives in vaccines, then trials should not be conducted (‘Victims of vaccination, February 16-28, 2011). It is better not to treat patients than poison them. People in India have the right to know what kind of medicines they are being provided and what are their possible effects. For instance, painkiller Nimesulide is banned in the UK, the US and Europe but is sold all over the sub-continent. Before taking any medicine, people should make sure it is not expired, substandard or not spurious. It is the responsibility of pharmacists and doctors to give proper medicines to patients. I recently toured the Dudhwa National Park in Uttar Pradesh. On my return, I was shocked to read the news that people of the Tharu community in Surma village in the park are allowed to use resources of the forest (‘Grassroots victory’, March 1-15, 2011). It is the same park where rules of maintaining nature in its pristine form, recommended by various government committees, have been flouted. A state highway to the Nepal border runs through buffer areas; a railway line up to Dudhwa station frequently slaughters tigers, deer and elephants. Allowing tribals in the park will create another fissure which will serve the interests of the timber mafia. 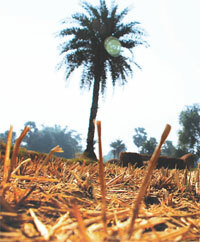 This refers to ‘Misguided rules’, ‘Grassroots victory’ and ‘Kaziranga simmers on fringes’ (March 1-15, 2011). Introducing Forest Rights Act of 2006 was a historical step as it recognises rights of forest dwellers over minor forest produce. The Act, however, has garnered negative publicity since its inception. Opponents, including wildlife conservationists and state forest departments, claim it will lead to forest destruction. The Act has many lacunae. It does not define forest dwellers properly, allowing encroachers to claim land through dubious ways. The Act fails even when it comes to conservation efforts like relocating people from national parks. These gaps need to be filled. 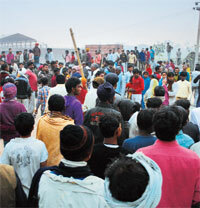 Use of batons and tear gas by police officials on protesters of an asbestos plant in Chainpur village in Bihar is condemnable (‘Asbestos fight gets ugly’, February 16-28, 2010). It is shocking that instead of stopping construction of the plant, the state government supported the company. The public firm went back on its promise it made to the residents of the village that it would build an iron rod factory. Suppressing the poor, taking away their land by force cannot be allowed. We should fight. The public should learn a thing or two from the revolutions in Egypt and Tunisia. Natural calamities have destroyed our forests. It is time everyone took the responsibility of generating forests. Seeds of trees like neem should be made available in offices of district forest departments so that people can sow them in wastelands during rainy season. The Karnataka government did a commendable job by banning endosulfan (‘Karnataka bans endosulfan’, March 1-15, 2011). The fact that 73 countries have banned the pesticide proves its hazardous nature. I request the Indian Council of Medical Research to consider banning production of endosulfan throughout India. It is the primary duty of the Centre to protect public health.